It was November 21st 1994 and, with fourteen games of the season gone, we were rock bottom with just eight points on the board. Cue loads of jokes about some lad's driving license having more points than Everton…what mirth! Anyway, they were going into the game sitting pretty in third spot, a full 21 points ahead of us, and all the pre-match hype was about how many they were going to stick past us! But no-one saw the dogs of war coming! It was one of those nights at Goodison and everything came together as we kicked the Spice Boys (they really have always been an embarrassment!) off the park. 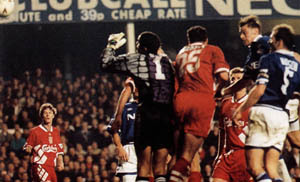 Then, on 56 minutes, Big Dunc got his head on an Andy Hinchcliffe inswinger and opened his account for the Blues! Everyone went mad and the legend was born! It was the first of his 61 goals for Everton and, quite possibly, the sweetest!